At the Arts Educational Schools, as well as dance and drama, drawing and painting were important and imaginatively taught. I was lucky to visit the original caves at Lascaux where those glistening animals, seemingly alive, were an in inspiration for life. I studied at St. Alban’s School of Art and the Slade School of Fine Art with William Coldstream, then a postgraduate year, studying the Renaissance masters in Italy. From a training in movement and dance, my work is based closely on the expression of human life and movement. Portraiture has always been a part of that. My first commission was in 1977 for a BBC film in the Everyman series.Teaching in London and Wiltshire, and latterly at Swindon School of Art and Design was combined with family life. The balance between painting, teaching and raising a large family has been a positive challenge. It has deepened my understanding of the human dynamics which are at the heart of every portrait. My five children now work in various fields of design, music and humanitarian charity, and are a collective inspiration to me. In 1995 teaching gave way to portraiture, and an open-house exhibition introduced me to a new clientele which led steadily to painting portraits nationwide. Besides portraits I make other figurative paintings from drawings. To see other paintings, oil pastels and exhibitions please visit Julietwoodmorepaintings.uk. 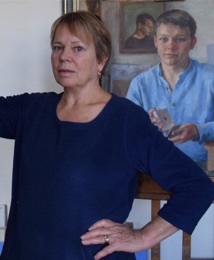 My portraits have been shown at the Royal Society of Portrait Painters, Contemporary Portrait Society and the New Grafton Portrait Centre from which, under David Wolfers, I’ve received interesting commissions. But many have also come my way by word of mouth, some of the best in Scotland where my twice-great uncle, ‘Glasgow Boy’ James Guthrie painted many portraits. My study for a portrait of Sir Michael Atiyah is in the Scottish National Portrait Gallery. I prepare my own canvases and work in oil paint or oil pastel on paper. My portraits vary from small and intimate which I love, to substantial, over life-size works for public spaces which are exciting. When painting group portraits I am glad of my dual experience of professional and family life. Click here to look in on a portrait sitting. The core character of an individual, revealed in exact shape and gesture, and how this can be expressed in the design of a painting is endlessly intriguing. The understanding which develops as we work together often leads to lasting friendship.